Finches have been popular pets for a long time. They are easy to care for and don't take up much room. Often they were kept in small wooden cages throughout their entire lives. Most had little room to fly and rarely were bred in captivity. Some, the more fortunate ones were given large fancy palace style wooden cages to live in. These finches were kept by the wealthy and used to add beauty to their homes. It is true that over all most finches are very easy to care for. Another finch (for company), nice cage, a bag of finch seed, fresh water and you're done. 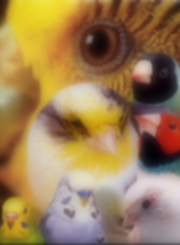 For a long time that was all anyone would do for their finches. In this day and age, things a little different. Some people buy or build large and decorative aviaries for their finches. Some blend in with the household furniture while others are huge extensions on a garage or shed. Many contain plants and real wood perches to give it a more 'natural' look and feel for the finches. Others don't go to quite those extremes. A small planted aviary, or spacious cage so everyone can sit and enjoy the birds and still devote hours to learning about their little finches. It is important to keep these cages out of the kitchen and away from drafty windows and doors. Diet had moved from basic finch seed only to complex and almost gourmet daily meals filled with seed, greens, vegetables, and egg. As a result finches are living longer than ever and reproducing in captivity. What has caused this surge in finch popularity? It has a lot to do with availability. 20+ years ago you had to spend a small fortune to import an exotic finch like a Gouldian or Whydah. Yes some were bred domestically but they were also very expensive and not always as healthy as their wild caught counterparts. Today most exotic species are bred in many countries of the world. While catching birds from the wild is still done, far too often for my liking, it has slowed down somewhat. There is a greater supply of locally bred finches. These finches are appearing more frequently in bird shows and bird fairs all over the world. Bird Clubs are springing up all over the place and when bird enthusiasts get together it's an event. At the last bird fair I attended, I saw species even I had never heard of. It's a finch fanciers dream and they open the finch varieties up to the general public. Finches are more readily available than ever before and there is a great deal more information about their care and needs out there. If you can't find a book or article, you can ask a breeder. Many of the people I talk with at bird fairs ask about the care of finches. They want something easy to care for which won't require a lot of time. These people are usually single and live alone in a small apartment where larger pets are not allowed. Finches can be great apartment birds. They aren't loud, they don't care if you are gone all day, and they won't tear up the furniture. Finches do very well for single people with active lives who work all day and don't want to come home to a empty house or apartment. The persons age does often play a role in whether they want a finch or some other bird. Many elderly like the easy care of the finches and their energetic noises. Those who are gone from the house most of the day enjoy relaxing to the sound if singing finches when they finally get a moment's rest. However finches aren't for everyone. The same goes for all pets actually. Home environment, family life and schedule, temperament (of the humans, not the finches), and age all play a part in deciding if you are the type of person who would want a finch. Far too often finches, as are other birds, are bought on impulse because they are "cute" or "pretty". Because many finch species are inexpensive people seem to consider them throw away birds. This is one reason why I tell people "finches aren't for everyone". If you buy one because it is cute or pretty also do the finch the service of learning about its diet and housing requirements as well as its temperament. On the other side of the spectrum are the people who shouldn't own finches. They are people with a houseful of small children who lack discipline. When families visit my table at local bird fairs and the first thing their kids try to do is frighten my finches, poke them, or try to open the cage doors. I know finches would not last long in that home. Finches don't handle that much stress well. Of course in a more structured home, finches can be a great learning experience for kids, teaching respect of all life and the responsibility to care for it. Smoking can lead to an early and swift finch death. Some air fresheners are just as lethal. A dog which barks all the time, or a bothersome cat can be a real problem for finches. Leaving on vacation and not making finch care arrangements often leads to dead finches. Finches need to eat and drink every day, putting extra food and water dishes in the cage simply does not work. Not only are Fido & Fluffy considered family members, finches and other birds are being brought up to that level of esteem. We name them, we talk about them, we talk to them, we spend hours chopping and cooking so they can have fresh eggfood or birdie bread, we love them. They don't know how good they've got it. Even what were once considered reject birds, those born with a physical disability, are precious and worth the extra work.